The £56,000 improvement project was funded by the Wandsworth Local Fund (WLF) – a charge levied by the council on developers – and was developed following extensive consultation with park users. It is part of a string of planned playground improvement projects over the next two years. 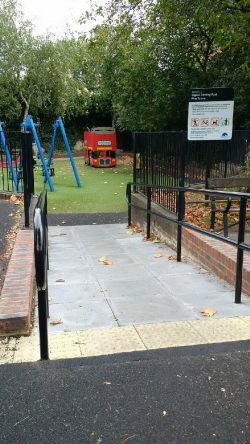 New equipment, including a play bus, has been installed, steps into the toddler area have been replaced with a ramp and old and damaged safety surfaces have been replaced with artificial grass. The project was managed by Wandsworth Council’s Design Service, supported by Enable Leisure and Culture and delivered by Wandsworth Operational Services. The changes are part of a policy to make sure all new and renovated playgrounds in the borough are accessible to all children, including those who use wheelchairs, are autistic or who have a visual or hearing disability. At King George’s Park £70k is being spent to resurface the junior playground. The works will begin in October 2016 where the safety surface will be removed and play bark installed. Leaders Garden in Putney is getting logs, stepping stones and bug hotels o make use of the shaded area and transform part of the garden. Works are set to be complete by mid 2017. £179,800 of funding has been agreed for a refurbishment of the junior play area for 8–16 year olds in Garratt Park. Work begins in 2017/2018. The Wandsworth Local Fund is the neighbourhood element of the Community Infrastructure Levy – a charge the council makes (mainly on new homes) to pay for the infrastructure needed to support the development, such as new or safer roads, park improvements or a new health centre. Fifteen per cent of the levy must be spent on projects that take into account the views of the neighbourhood where the new development has been built. Find out about applying for WLF funding.